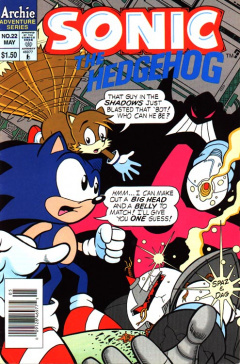 Sonic the Hedgehog 22 is the twenty-second issue of the Sonic the Hedgehog comic series. It was released in May 1995. It is the first issue of a Sonic the Hedgehog comic by Archie to directly continue a story from the previous issue. In this case, Robotnik's supposed death. This comic features two stories: The Return, and Tails' Knighttime Story. It is the future: a free peaceful Mobius run by Princess Sally, now married to Sonic with two children. Sally and Sonic are outside with their two children, until the sky starts to become filled with clouds and the wind picks up. Despite the stormy conditions, Sonic tells Sally that it'll pass. All of a sudden, a lightning bolt strikes a tree near where his kids are playing. Sonic runs over in the knick-of-time and moves his children away, despite them having super-speed themselves. Sonic looks at the tree, as it is replaced with a glowing figure of Robotnik, who glides down in front of Sonic. Sally and Sonic look on in shock as the Robotnik figure gives an evil smile, confusing their daughter. Another lightning bolt hits right where the figure is, making it disappear. Sonic's son tells his sister that it's the bogeyman, making Sonic smile. Sonic recalls the situation, with Sally thinking Robotnik may have returned. He goes over to her and tries to ensure her that Robotnik was, indeed, destroyed in the past by E.V.E.. All he can think of is that it was a freak of nature occurrence. He steps out of the machine, still in mid-sentence with his prior conversation with E.V.E.. He looks around, wondering where he is, until the computer on the system acknowledges the vessel as his ship and Robotnik as his 'friend'. He turns around and sees a large mechanical doppelgänger of himself on a computer screen. The robotic Robotnik figure tells Robotnik that he is what is left of Robotnik, and that Robotnik has been sent to an alternate reality. Robotnik, still confused, annoys the robotic Robotnik, so he decides to tell him the story of what happened to him. In this reality, almost defeated at the hands of Sonic, this reality's Robotnik decided to roboticize himself and then transfered himself to a space station he built over Mobius. However, the station wasn't complete and all he could do was be uploaded to the stations systems and be able to control it until it lost power. Robotnik tries to convince this robotic Robotnik that only a battle has been lost, and that he can return back to his timeline to continue the fight against Sonic, and to ensure victory. He asks the robotic Robotnik if he can send him on the trans-dimensional highway so he can return to his reality. The reality's Robotnik is able to, so Robotnik steps on the machine he came out of. With a few modifications, Robotnik is sent on his way back to his own time. Back in the normal timeline, the Freedom Fighters, having won, start to clean up and pack the left-over Swatbot and robotic parts left over from the war. There is one issue that is bugging Sally, and that is why Snively isn't continuing Robotnik's efforts. Rotor thinks it could be due to Robotnik not giving Snively enough information on his empire. Unknown to them, Snively is eavesdropping on them with Robotnik's monitor, realizing that Rotor knows exactly why he hasn't continued the war: Robotnik never shared the information on his empire with him. He goes into a temper tantrum, realizing that Sonic has indeed won, and he is powerless to stop him. Suddenly, all the computers around Snively start to activate, as he gets up and sees Robotnik's face on every monitor. His message announces over Mobius through every monitor. He calls out to the Freedom Fighters, that if he can't have Mobius, nobody can. The Freedom Fighters watch on with a large screen nearby. For his last act, Robotnik sends out every single resource he has to destroy Mobius itself and make it a wasteland. The Swatbots arrive at the Freedom Fighters' dump, and start to attack. Sonic tells Sally to distract the bots so he can use his speed to take them out. He runs out as the Swatbots locate Sally. She is, however, unamused at the idea, wanting to get a piece of action and not wanting to sit around all the time. Before she can do anything, Sonic arrives back and takes out the Swatbots. Tails then calls out to Sonic as three more Swatbots arrive. With endless hordes of Swatbots arriving, Sonic decides that they need a better plan to take care of them. Antoine, from behind, calls out to the group after locating an exit. He looks back through the door again, only to see an extremely large horde of Swatbots ready to attack. In Robotropolis, the Swatbots have arrived in Robotnik's lair and holds Snively at gunpoint. Snively tries to talk them out of it, although the directive doesn't state to leave Robotropolis, or anything for that matter, untouched. It fires, but Snively jumps out of the way, just missing the laser blast. A scared Snively ducks on the ground as the Swatbot prepares to fire again, until the wall behind it explodes. Robotnik, back to his old self, arrives and gloats that he can't leave Snively alone for a few minutes. Snively, however, is more scared about the Swatbots trying to kill him. Robotnik looks over as he sees his own Swatbot aiming its laser cannon at him. He takes out his own laser pistol and shoots the Swatbot for daring to kill his own master, then demands an explanation for the situation at hand. Snively tries to concede with Robotnik, telling him it wasn't his fault that Operation Wasteland as activated. Robotnik realizes that Snively uttered the words "Sonic has finally won it all", activating the automated Operation Wasteland program. He walks back to his lair to deal with the situation. Robotnik watches the operation proceed on his monitor, as Sonic runs away from a group of Swatbots. In order to have anything on Mobius to rule over, he must take action. The Freedom Fighters, meanwhile, are dealing with some of the Swatbots, but not enough of them. Everytime they try to escape, they are cut off. Robotnik observes that if he lets his Swatbots destroy the Freedom Fighters, he'll have nothing to rule. Despite his better judgement, he hits the abort button, deactivating all his robots. Sonic and the others watch as every single Swatbot in the area is deactivated, confusing all of them, but giving them the opportunity to escape. Not wanting to wait for them to reactivate, they take the moment and return back to Knothole. With Sonic's life saved by Robotnik, Snively notes that Sonic does, indeed, owe his life to Robotnik. Realizing that situation, he decides to use it as a strategy for himself, to bruise Sonic's ego. As the Freedom Fighters escape the dump, Robotnik appears on a monitor and asks Sonic if he is curious who saved his group. He looks over to see Robotnik speaking, in real-time, realizing he is alive again, despite being zapped in front of his eyes. Robotnik goes ahead and tells him that it was he who saved his life, confusing Sonic as to his intentions, until he tells the hedgehog that this proves that their fate is under his control. Sonic gets mad, but Sally holds him back. With the battle over for the day, and his point sent, Robotnik tells Sonic and his friends to leave. As Sonic tries to retort about fighting next time, Robotnik interupts, telling him the outcome of the next battle will be of his choosing: when he leasts expects it. The fight continues on, for Robotnik has returned. Every night before bedtime, Sally tells Tails a story to help him go to sleep. Tonight is different, as Tails pretends to be Sonic and starts running around his bedroom. Sally stops him infront of his large Sonic poster, telling him it is bedtime and not playtime. He tells Sally that Sonic gets all the fun and action, while he gets baby-sat. She tries to convince him that, although it looks fun, what he does is dangerous and hard. She then refers to an old saying, that one shouldn't wish to be someone else unless they have been in that person's armor. This confuses Tails, so Sally decides to explain it through a tale about Ancient Mobius. In Ancient Mobius, a knight known as Sir Runalot (Sonic in armor) who protected the land. Sir Runalot always had his armor polished by his assistant Mortail (Tails in servant garb). Mortail would always follow Runalot to wherever he goes. Sir Runalot was easily able to take care of the enemies of the kingdom, with Mortail at his side to watch. He would also watch as Runalot would be showered in gifts from the village citizens and won the hearts of the maidens on Mobius (including Sally). All of this attention made Mortail jealous, as he wanted the glory and the ability to be a hero. One day, Runalot decided to take a vacation, leaving Mortail behind to polish his armor. Suddenly, the helmet fell on Mortail's head, giving him an idea. He donned the armor and ran out into the village, where he was met by Sally and Uncle Chuck, who fell for the ruse and thought he was Sir Runalot. In return for his services, they offer him gifts and kisses. He decides to take up the duty and follows the two to his task. They arrive in an area called Robotannia, where the evil Sir Knightmare (Robotnik in black armor with a mace) plans to take over their kingdom. The two push Mortail into Sir Knightmare's view. Sir Knightmare, bringing out a fake horse, charges at Mortail, who runs away. The armor, however, is too heavy for Mortail and he ends up tripping. He gives in, and before Knightmare can hit him, he takes off the helmet and reveals himself. The evil Sir Knightmare, however, still thinks he's Sir Runalot due to the armor, and prepares to attack. As he swings his mace, Sir Runalot arrives back and slices it in half. With airlines not invented yet, Sir Runalot couldn't go on his vacation afterall. With the real Sir Runalot back, Sir Knightmare charges at him. He moves away quickly, causing Sir Knightmare to smash into a rock wall behind him. Back in the kingdom, Mortail returns the armor back to Sir Runalot, apologizing. Sir Runalot, however, doesn't want the armor back, finding out he can run faster without it. Now that Mortail had realized that being a hero wasn't fun and games, he continued on with life being himself. With the story done, Sally asks Tails if he understood the story. She looks around, realizing Tails is missing. She looks around until Tails calls for her outside. She looks out a window and sees Tails running around outside. The story gave him the idea to take Sonic's sneakers to play as Sonic. Sally giggles, realizing she should stick to fairy tales. This issue partially takes place in the future Mobius, first introduced in Sonic In Your Face!. The robotic Robotnik shown in this issue looks the same as Robo-Robotnik, later to become Dr. Eggman. The circumstances of his transformation are almost the same as they were with Robo-Robotnik when he was introduced in issue 19, except the robotic Robotnik in this issue decided to upload himself to a computer rather than remain himself. This issue's Sonic-Grams reveals that Uncle Chuck created Sonic's sneakers.